Until 2016, OSRAM had been serving both professional and private customers through a combination of various business segments. In the interest of unleashing the maximum market impact of each business segment, these business segments began operating in two distinct entities. Consequently OSRAM has sold the lamp business as newly established company LEDVANCE in 2016. OSRAM is focusing on digital future of light with its divisions Automotive Lighting (AM), Opto Semiconductors including its cross-sector LED, infrared and laser-component products (OS), and Digital (DI). LED and traditional lamps are now with the LEDVANCE company that includes smart-home products and LEDVANCE over-the-counter luminaires. Who will my contact partner for service or sales be in the future? Your contact partner will as far as possible be the same in the future, since after the separation, those employees responsible will be moving over to the new business together with the products. Will I continue to receive the OSRAM quality which I am accustomed to? Yes. In general, the responsible employees and plants have moved over to the new company LEDVANCE together with the respective products. LEDVANCE products will however in certain isolated cases continue to be produced at OSRAM. Nothing will initially change about the production processes. Product quality will remain the same. Why is OSRAM selling its lamp division? The lighting industry finds itself in a continuous state of change. In order to be able to respond to this change and remain competitive in the long term, businesses like OSRAM have to adapt to this. Through independence, LEDVANCE will gain more streamlined structures and creative freedom which will enable the new company to react quicker to changing market conditions and individual customer requirements. What will happen to my OSRAM warranty? Warranties will be preserved. The first contact partner in the event of a warranty claim is always the dealer which the consumer purchased the product from. The warranty arrangements will still be valid after sale of the lamp business. What is the difference between OSRAM and LEDVANCE? LEDVANCE is focused on general lighting for end customers, whereas OSRAM is also developing digital networked lighting solutions and components for industry, commercial and public customers. Are OSRAM’s luminaires and controls now sold by LEDVANCE? OSRAM continues to offer luminaires and controls for professional applications, and will develop further solutions for these. Meanwhile, LEDVANCE has taken over the OSRAM luminaires and controls for residential applications, and is now also developing its own range of luminaires and controls for professional applications. Which products can I buy from LEDVANCE? LEDVANCE supplies specialist shops and end consumers with a wide range of products ranging from LED and halogen lamps, right through to Smart Home products and LEDVANCE brand OTC lamps. In the case of questions about LEDVANCE products, please send an e-mail to info@ledvance.com. Why was the lamps business sold? The lighting industry finds itself in a continuous state of change. In order to be able to respond to this change and remain the best partner also in the long term, businesses like OSRAM have to adapt to this. The decision to sell the lamps business followed an intensive review of strategic options for that segment. For OSRAM the successful separation and sale of LEDVANCE is a milestone to actively shape the industry transformation through innovation, setting new standards in light technology with all its visible and invisible applications even stronger in the future. By anticipating the right innovations with exciting new technologies, solutions and deep application expertise across industries and technologies OSRAM contributes to the customers’ competitive edge. The portfolio includes high-tech applications based on semiconductor technology such as infrared or laser lighting. The products are used in highly diverse applications ranging from virtual reality, autonomous driving or mobile phones to smart and connected lighting solutions in cars, buildings and cities. Why is LEDVANCE also using the OSRAM brand? In general, together with the respective lamps product portfolio also the responsible employees and plants have moved over to the new company LEDVANCE. Nothing will initially change about the production processes. Product quality will remain the same, so OSRAM lamps will remain OSRAM lamps. 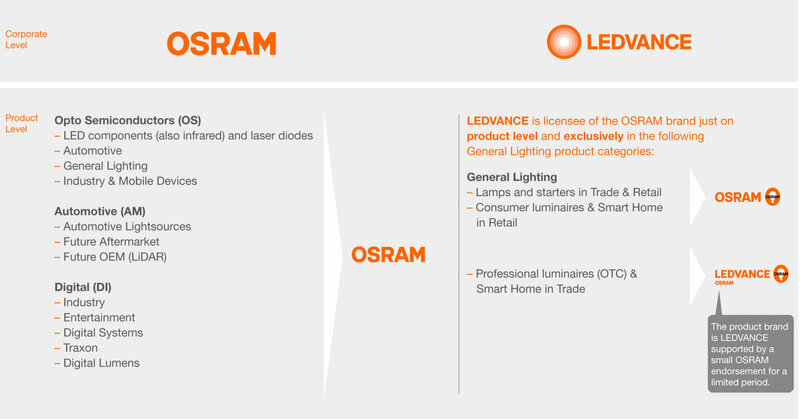 Therefore LEDVANCE is allowed to use the OSRAM brand on product level and exclusively in clearly defined product categories (focus on lamps and luminaires/ smart home for private end consumers) as a licensee of the OSRAM brand.